To be honest, I always feel a bit high walking into an antique store or flea market. Even in college when I had no money and was taking out student loans and working part time, I loved visiting the antique stores in my college town. I couldn’t afford bupkiss, but it was still fun looking…and dreaming. Even at my small, much-frequented Goodwill, I still get excited! The other day I spent 30 minutes there in blissful, unhurried picking. I put a few things in my basket. Took a few things out! In the end I came up with three purchases I call the “cute collection”–a nice crocheted baby blanket, a book on gnomes in Italian, and a made-in-Japan canister (sans lid) that will work wonderfully as an herb planter or kitchen spoon holder. No, these are little, bread-and-butter purchases. 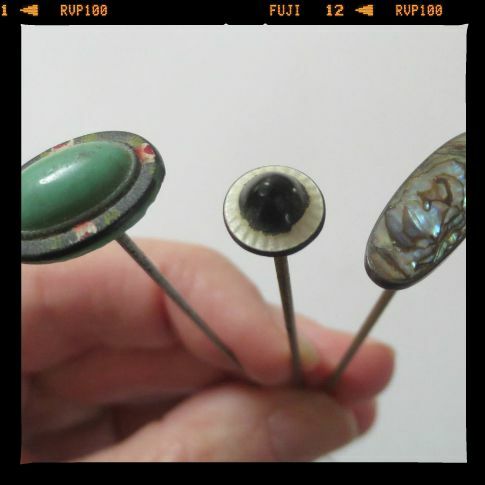 Like the three small old hat pins I bought in a private pick. They were sweet, but not worth much. I paid $3 for them. And since two had a little damage and there are hundreds (and hundreds) of hat pins for sale on Etsy, I listed them for a modest $18. They sold the other day. Anyway I’m excited for the weekend. Hopefully I’ll get to a few yard sales and then on Saturday night its a free concert. P.S. I’m having fun with a new photo editor. Thoughts on the photos with the “film edge”? Thumbs up or down? Thumbs up on the film edge! In fact, thumbs up on anything you do. Enjoy you so much! Agreed for a thumbs up on the new photo format!